I've seen all the episodes of Friends in random order, but I've never watched them starting with the 1st episode. I recently did that (thank you, Netflix for making that available in January...perfect timing with a newborn!! ), and I noticed a few things I've never noticed before. 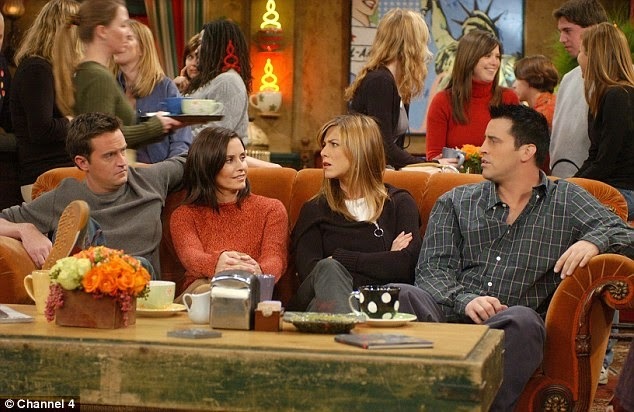 I want to sit down with a bunch of Friends enthusiasts and have a long conversation. Let me know if you're available to do that. *My favorite season by far is Season 5. Episode 1 starts with the aftermath of Ross saying Rachel's name at the wedding and ends with the episode in Vegas. Super cute, of course, and yes she started working at Ralph Lauren...but I never noticed a moment after season 5 where the actors' hair wasn't done or when they wore a super casual outfit. 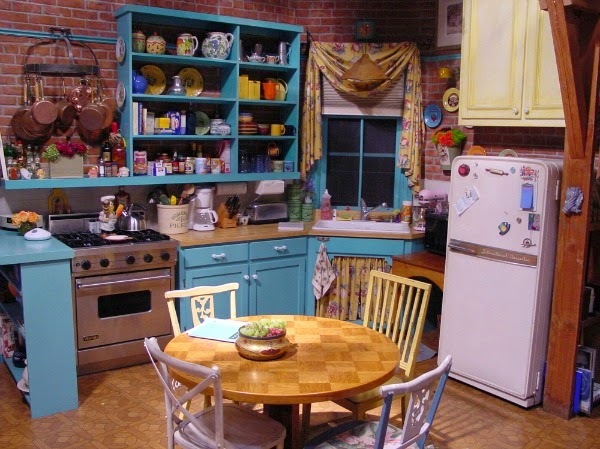 *I really love the mismatched colors and designs of the kitchen chairs in Monica's apartment. I'd like to do something kinda like that one day. But it probably will never happen because my brain is too Pottery Barn symmetrical. 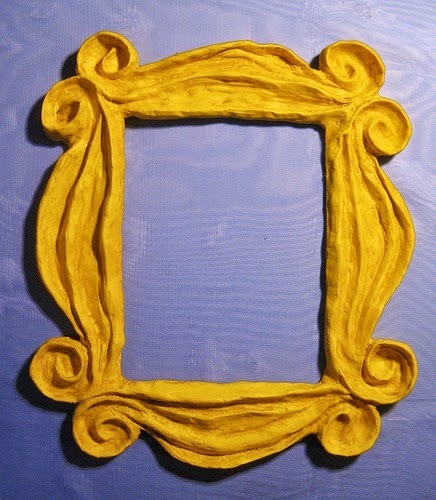 *All the characters had great moments, but the BEST moments were with Ross. -Fist pump together (and elbows) in place of the finger...hah! *Each episode featured a different character in the earlier seasons. After season 6, the plot shifted to focus mainly on Rachel's character. I missed a lot of Monica's spunky personality towards the end. *I find myself to be a little...."Monica". *I actually wish Rachel ended up with Joey. I never thought that before watching it all the way through. They were so good together. *I realllyyyy want a mug like the ones they used at the coffee house. These polka dots need to be in my cabinet. *And I seriously considered painting my pantry door purple and putting a gold frame on it. Too much? After finishing up the seasons, I watched interviews online with the cast, and read all the "Things you didn't know about Friends" articles I could find on Pinterest. I knew them all, by the way. And yes...I'm slowly coming out of my obsession. I don't need an intervention. Talk to me about Friends!!! I always loved friends and still find myself saying "that happened on friends" about everyday occurrences! Ok, this post could not have come at a better time! My husband and I just finished watching Friends last night and I'm in complete denial and withdraw. I'm going to have to go and google those interviews just to help ease myself back into a life without Friends every night slowly. 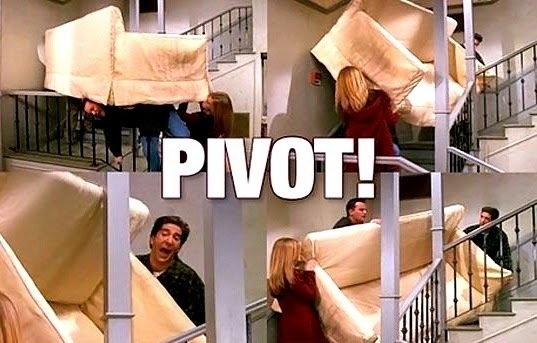 To this day, we will say Pivot! when moving furniture. My favorite ep is the trivia one -- "Miss Chanandler Bong." I LOVE THIS POST! i have been watching friends lately and you are soooo right about them looking "done up" in the later episodes. I liked it when they were more casual! 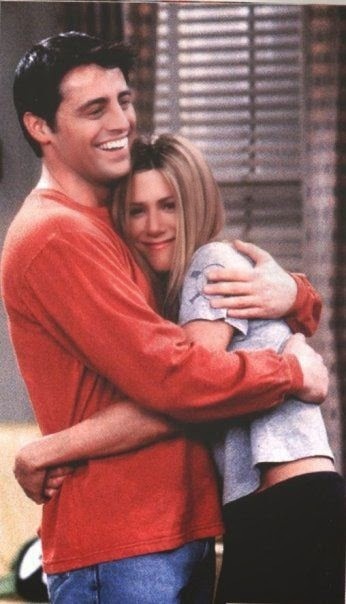 But I love Ross and Rachel together - they are each other's lobsters! I just barely got into watching Friends, myself, but like you, not in the same order. I'm waiting for the summer, so we can have a free trial of Netflix and then I'll binge it! I'm a huge Friends fan and I watch it every single day. My sister is legit obsessed and her kitchen has a Central Perk theme. She and I have entire conversations only speaking in quotes from Friends and people look at us weird. I love them all, but one of my favorite episodes is the unagi one. I can just think about it and start laughing. I could talk about Friends all day! I always tell my husband that everything can be related to a Friends episode, and I point it out in real life whenever possible ;)Also, Ross is my favorite, hands down. I've never watched all the seasons straight through either and now I want to! Friends is sentimental to me because my Mom and I used to lay in bed and watch it together before going to bed at night. Friends (& Greys Anatomy) are my go to "I want the TV on but don't really want to watch TV" shows. I have loved watching the episodes from start to finish. I've been amazed at the number of episodes I had never seen before! I didn't watch the show during its original run so any episodes not syndicated or are on a limited basis I've missed out on. Ooh I'm in the process of doing the exact same thing right now - I started from episode 1, season 1 and am taking it slow but ugh I'm just falling in love with it all over again. Definitely agree with all of your observations... a few things on my mind - 1) I had this sudden realization that none of the characters are likeable as individuals, but they just really mesh so well with each other and as a group that I think that's why we love them so much, and 2) one of the coolest Buzzfeed articles I read pointed out the Reserved sign on their coffee couch table which makes so much more sense thinking about how they're always there with barely any interruptions ever! Girlfriend hit me up for an email sesh- I LOVE me some Friends! Did you ever notice the "reserved" sign on the coffee table at the coffee shop?! No wonder they always had the couch available!! ;) and I secretly always kind of wanted Joey and Rachel to end up together, too!!!! Oh my gosh, I love this! I don't have a Friends addiction (not anymore, anyways…;), but when it was on I adored it. I may or may not get obsessed with shows and books and them Pinterest the living daylights out of them. Ha! This is so fun! 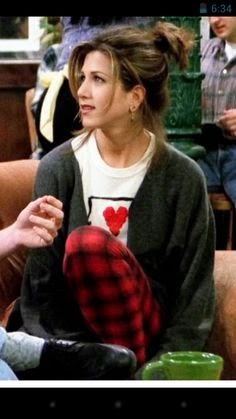 I always thought Rachel had the best best style. oh my gosh I love this post - Friends is my jam!!! I am in the same boat, I am actually watching episode two right now and I am so excited for how many there are left! If you love the show make sure to watch the episode of Courtney Cox doing the new Friends version of Heads Up on Ellen last week! I'm way behind in commenting but I love this! I could write a book about this show but I will limit my remarks to a) there is literally a Friends quote for every situation (which I prove on near-daily basis to my husband) and b) I love Chandler. Heck, I AM Chandler- sarcasm, awkwardness, and all. :) But after him I think Phoebe makes me laugh the hardest. The first episode I ever watched was the one where she meets Mike's family and tried to act all fancy. I was in tears. So funny!